Seaward International has pub- lished a new 32-page booklet on its complete line of Sea Float marine buoys and floats. This booklet includes complete speci- fications, such as net buoyancy, weight and diameter, on each type and model of buoy and float. Ameron marine coatings meet quick turnaround requirements of tuna fishing vessel owners with high-performance coatings like Dimetcote® E-Z II, a new generation inorganic zinc in single-package formulation which reduces application labor costs and is easily applied. Commercial vessels around the world depend on Ameron marine coatings like Amercoat® 70, a controlled-release flaked copper coating with economical anti- fouling protection benefits. Dimetcote/Amercoat marine 32 plifies buoy selection, and the separate section of alternate end fittings adds design flexibility. Amercoat 64/386. This cpoxy system resists a broad range of chcmicals and solvents. The world's first fleet of 326,000 DWT Very Large Crude tional also manufactures a line of floats providing subsurface buoyancy to 400 feet of sub- mergence — the Deepfloat. Float are two types of closed-cell foam. The outer layer is semi- flexible to help absorb impacts. Dimetcote 3, as the foundation for an effective marine coatings system which produced dramatic economic benefits. Brea, California 92621 for infor- mation or call (714) 529-1951. The inner layer is rigid foam, which bonds to the central strength member. Longhorn has corporate offices in the Oil Center Complex in Okla- homa City. Hydranautics drill floor skidding system consisting of four 150-ton mechanical Pin Claw Base as- semblies and a control console. The two semisubmersibles are the first in the industry to be de- signed with a drill floor that can be moved both longitudinally and transversely. Temple Drilling Company, Hous- ton, Texas, near Freeport, Texas. The second, for Phoenix Man- agement, Houston, will be used for drilling in Texas, Louisiana, and in the Gulf of Mexico. Industries, Inc., has published a brochure detailing the applica- tions and specifications of its line of nylon-reinforced polyethy- lene sheetings. Photographs of applications and specification charts for the company's three, five, and seven-ply covers are in- cluded. The sheets are used for shipping and storage protection, stockpile covers, crate and con- tainer linings, warehouse and cargo space dividers, paint and welding booth curtains, work shelters and enclosures, and pit and lagoon liners. 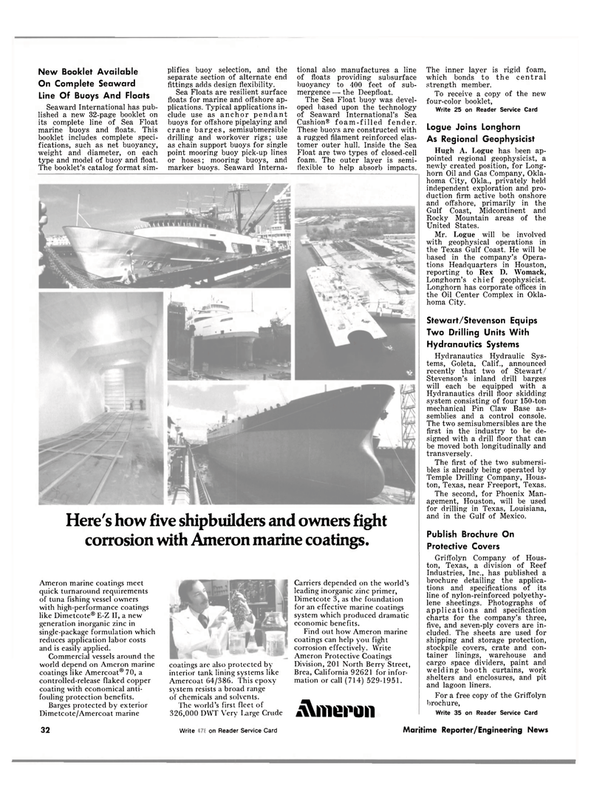 Here's how five shipbuilders and owners fight corrosion with Ameron marine coatings.